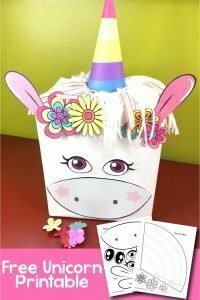 A fun printable to use when creating a unicorn Valentine’s Day box. It is one of my nieces’ favorite crafts! It’s super easy and fun to put together. Try adding luminescent papers or different fun wrapping paper instead of the butcher paper for a more colorful unicorn. If you want instructions and ideas on how I made mine you can visit this post about Valentine’s Day box crafts. You can also check out this fun STEM lesson on making Unicorn Poop (glitter slime).